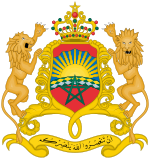 The Moroccan Parliament has two chambers. The House of Representatives (Arabic: مجلس النواب‎, Berber: Agraw imarayen ⴰⴳⵔⴰⵡ ⵉⵎⴰⵔⴰⵢⴻⵏ) has 395 members elected for a five-year term, 315 elected in multi-seat constituencies and 80 in two national lists dedicated to promote gender equality and national youth. The other chamber is the House of Councillors. ^ "16/01/2017: Habib El Malki elected President of the House of Representatives, on Monday 16 January 2017". Chambredesrepresentants.ma. Retrieved 2017-03-07. ^ Igrouane, Youssef (27 March 2017). "Morocco's New Government Coalition Includes 30 Ministers". Morocco World News. Retrieved 1 April 2017. This page was last edited on 2 February 2019, at 01:44 (UTC).